Stainless steel bollards provide the best looking and most durable parking posts for important buildings, parks and streetscapes. Due to their cost, most stainless steel bollards are actually covers that go over regular steel bollards. Stainless steel is much more expensive than bare or even galvanized steel. So these commercial bollards are normally made of Schedule 40 or 80 (or higher) bare or galvanized steel covered by Schedule 10 Stainless covers the next even size up. So, for example, a 4" steel bollard has a 6" stainless steel cover fastened by set screws at the bottom. Unless you are required to make the bollard out of stainless, we highly recommend that you use regular or galvanized steel for the bollard with a stainless bollard cover. In either case, we can get you a quote in one business day. 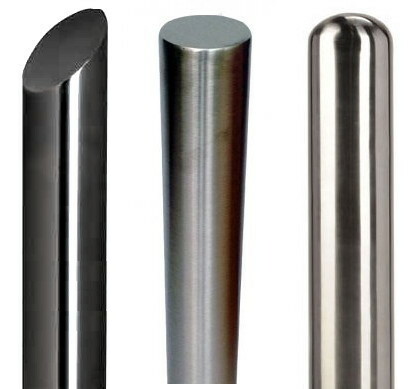 If you would like a quote on STAINLESS STEEL BOLLARDS, (not covers) please click for a quote. If you would like a quote on STAINLESS STEEL COVERS, please go to the SS Bollard Covers page. Stainless steel is made in 2 types: 304 and 316. If you live near saltwater or where salt is used in the winter, we strongly recommend 316 stainless steel. It is made with molybdenum, which changes it to Marine Grade Stainless. It resists corrosion much better than 304. If not, use 304. It is less expensive. Flat invites sitting, birds (and their gifts), and empty bottles. We recommend either a dome or slant top. They discourage other uses. Commercial bollards are usually made to prevent vehicle from entering a space, so they need to be strong. We offer even sizes from 4" to 12" in diameter. Schedule 10 6" is .134 wall thickness and 9.29 lbs/ft. Schedule 80 6" is .432" wall thickness and 28.57 lbs/foot. Bollards for commercial use should be at least Schedule 40 and buried, not bolted down. 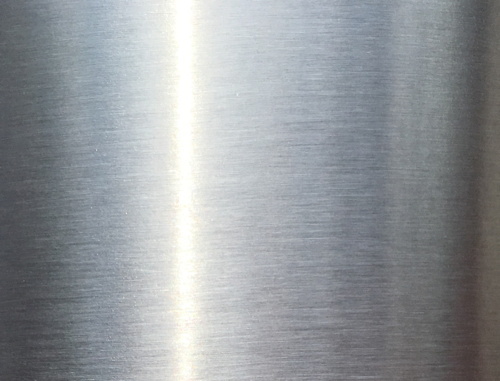 The finish on stainless steel bollards and covers is almost always a #4 brushed finish. After the piece is made, it is polished. A brush finish can be made fairly quickly, while a mirrored finish takes much longer. Consequently, it costs much more. Brushed also looks better longer. We recommend the #4 brush finish as shown here. Most commercial bollards are installed to prevent damage by vehicles, so they need to be strong. Consequently, most are core bollards, meaning they are buried in the ground. They can also be made as a plated bollard with sits on a square base and is bolted to the floor. Plated bollard are not very strong. Wall thickness for most commercial core bollards would be at least schedule 40. Stainless type: either 304 or 316. 316 is maritime grade and resists salt and sea water. 316 is more expensive. There are so many different configurations that we ask you to fill out a quick quote or call with your specs. We will get you a quick quote including shipping, usually by the next business day. Lead time is usually 4-6 weeks. All are custom fabricated. These removable bollards are made entirely from Stainless Steel. The stainless steel bollard sits in an 12-18" below ground stainless sleeve with a locking cap, normally in 4" or 6" diameter that is 36" in height above ground. We can make other sizes. Here is a drawing of a removable stainless steel bollard. We normally use Schedule 10 for removables, but can do them in Schedule 40 if you prefer. Please call with details about your job if you are interested. We are glad to help figure out the best solution.